Fans heading to see Kladno take on Havirov in the Czech Republic are going to get a treat, as Jaromir Jagr will be back in the lineup for the first time in almost a year. Jagr will skate on Kladno’s first line alongside Tomas Plekanec, who returned home after seeing his contract terminated by the Montreal Canadiens earlier this year. Jagr, 47, owns the Kladno club and has maintained a desire to continue his playing career even into his late forties. The legendary NHL winger couldn’t find much of a fit with the Calgary Flames last season after struggling with injury, and ended up being loaned back to Kladno to finish out the year. With that loan he failed to reach some of the performance bonuses in the one-year pact with Calgary, but there’s little reason to worry about his financial situation after a long and prosperous NHL career. In 1,733 regular season games Jagr recorded 1,921 points, good for second all-time behind only Wayne Gretzky. His 766 goals puts him third all-time, and he won nearly every individual and team trophy available during his long career. A two-time Stanley Cup champion, and member of the triple gold club (which includes gold medals at the Olympics and World Championships), Jagr also took home five Art Ross trophies, three Ted Lindsay (then called Lester B. Pearson) Awards, and a Hart Trophy as the league’s MVP. There seems to be just one thing left on the accomplishment list for Jagr, and that’s getting Kladno back into the top Czech league after they suffered relegation a few years ago. When the Montreal Canadiens terminated Tomas Plekanec’ contract earlier this season, he made it clear that he would head back to the Czech Republic to continue his playing career. The next thing we heard was that both Kladno—the team owned by former NHL star Jaromir Jagr—and HC Kometa Brno wanted to acquire his services. Now it turns out they will both have a piece of the veteran forward. In a press conference alongside Jagr on Monday, Plekanec was announced as a new member of Kladno who will also play games for Brno at various times throughout the year. The two teams are in different divisions after Kladno’s relegation a few years ago. Plekanec, 36, retired from the NHL after agreeing to terminate his contract, and will return to his hometown of Kladno to try and help them earn a promotion to the Czech Extraliga once again. Used to a more rigorous schedule though, he will also play games for Brno before eventually making a decision between the two closer to the end of the year. The veteran center played 1,001 regular season games in the NHL, all but 17 of those coming with the Canadiens. He never did get the chance to lift a Stanley Cup but had plenty of success in the playoffs, scoring 53 points in 94 games. He very well could face off against some of those NHL opponents once again at the World Championships next spring, a tournament he has attended ten times for his country, serving as captain on multiple occasions. Sunday: Elliotte Friedman reports that Plekanec has cleared waivers. Friday: Despite the Montreal Canadiens suffering several injuries to their forward group, the team announced today that they will place Tomas Plekanec on unconditional waivers for the purpose of a mutual contract termination. Plekanec hasn’t seen much ice time this season but is close to returning from his latest minor injury, but will not suit up again for the Canadiens. At the press conference to discuss the move with the media, GM Marc Bergevin explained that this was a “hockey decision” to let Plekanec go. The 36-year old forward was near tears when talking about always wanting to retire in Montreal, but did note that he would look for opportunities in the Czech Republic for the next few years. It seems as though his NHL days are over. Plekanec spoke about how the team is in good hands with the young group in the dressing room, and how Bergevin did approach him with the idea of a trade at one point before making this decision. Though there is still the formality of clearing waivers and then terminating the contract tomorrow, it seems like the end of the North American journey for Plekanec. Selected in the third round of the 2001 draft, he would make an impact at the AHL level right away and show that the rest of the league made a mistake in passing on him. By the time the league returned from lockout in 2005, he was a full-time player for the Canadiens and wouldn’t look back. Plekanec played in at least 77 games for 11 consecutive seasons (not counting the lockout-shortened 2012-13, in which he played 47 of 48) and was the picture of health and consistency for a team that went through plenty of change. Hitting a career-high of 70 points in 2009-10, Plekanec was a huge part of a Montreal team that went to the Eastern Conference Finals. The Canadiens will not be on the hook for any of Plekanec’s cap hit, even though he signed his most recent contract over the age of 35. Because the deal was just for one season, the restrictions usually applied to 35+ deals—that is, a cap hit that remains with the team regardless of what happens to the player—do not apply. Only multi-year contracts are punished in this way, meaning the Canadiens are free and clear of anything to do with Plekanec’s contract. In fact, the last year has been quite beneficial for the Canadiens when it comes to Plekanec. Last spring they traded the veteran center to their rival Toronto Maple Leafs for a package that included a second round pick, only to see him return to play his 1,000th game in Montreal this year. The Maple Leafs were knocked out of the first round anyway, and no other piece from the deal is still on either roster. The fact that he’s willing to step aside and allow the team to fill the roster with the next wave of Montreal forwards is just the latest in a long career filled with putting the Canadiens ahead of himself. 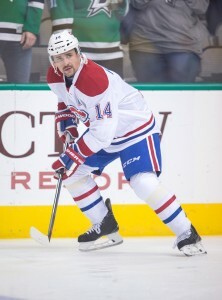 Known best for his trademark turtleneck and goatee, Plekanec will not go down alongside the very greats of the Montreal franchise. He was never part of a Stanley Cup run, and scored just 608 points in his 1,001 games. Still, he’ll be remembered as an efficient soldier by many fans and revered for his loyalty to the franchise to the very end. The six-year, $31MM extension that Tampa Bay gave winger Yanni Gourde on Friday raised more than a few eyebrows given his relative inexperience. Matt Larkin of The Hockey News suggests that the Lightning may have created another problem for themselves with the move as it pertains to pending RFA center Brayden Point. His agent has already indicated that his preference is to wait until the summer to get a new deal for Point finalized and with a strong start that has seen him collect 14 points in 12 games to start the season, the asking price is only going up at this rate. Accordingly, Larkin likens the situation to Toronto and RFA William Nylander where the team may be banking on Point taking a discount to keep the core intact. If he’s unwilling to do so (and doesn’t want to take a bridge contract), GM Julien BriseBois may have to move out a couple of players before next season to free up enough room to re-sign Point and fill out his roster. Canadiens center Tomas Plekanec returned to practice for the first time since sustaining a back injury in mid-October, notes TVA Sports’ Renaud Lavoie (Twitter link). The veteran has played in just three games this season after beginning the year as a healthy scratch and then suffering this injury just after reaching the 1,000 games played milestone. While he is still likely at least a few days away from returning, it’s worth noting that Montreal is carrying a full roster and they have already lost one player to waivers as a result of that crunch earlier this season. Sabres center Tage Thompson will be scratched for the sixth time already this afternoon which has led to some discussion about whether or not the 21-year-old would be better served playing with AHL Rochester instead. Head coach Phil Housley told Bill Hoppe of the Olean Times Herald that they believe that there’s value in keeping him up for extra drills after practice and video sessions but acknowledged that playing time is still most important for his development. With that in mind, it wouldn’t be surprising to see him sent down if he’s not back in Buffalo’s lineup over the next few games. The 2019 unrestricted free agent class was supposed to be a super group, but since names like Tyler Seguin, Drew Doughty and Oliver Ekman-Larsson have re-signed there isn’t quite as much fanfare surrounding it. Still, Erik Karlsson headlines what could be an expensive July 1st and Craig Custance of The Athletic (subscription required) does his best to break down the situations surrounding the top 25 options. The Columbus Blue Jackets feature prominently with two of the top three names, including Artemi Panarin who Custance terms as a possibility for “this year’s version of John Tavares.” Panarin is off to a great start, and could be a franchise-altering talent that’s available at the deadline if there isn’t any progress between his camp and the Blue Jackets. When the Swedish team lost in the gold medal game at the 2018 World Junior Championship, silver medals were placed around each coach’s neck while Canada celebrated their victory. Those coaches almost immediately removed the medals despite a rule that they must wear them during the celebration, leading to an eventual suspension for the entire staff. That suspension was supposed to keep them from working the 2019 tournament, but today was overturned by the Court of Arbitration for Sport. Tomas Monten, Nizze Landen and Henrik Stridh will be allowed to coach at this year’s tournament after all. The Montreal Canadiens haven’t used Tomas Plekanec much this season, and now will be without his services altogether for the next few weeks. Plekanec has been moved to injured reserve with a lower back injury, and will be out “several weeks.” The veteran center celebrated his 1000th game recently, and has one goal in three appearances with Montreal this season.